Auto paintless hail damage repair is the fastest, most cost efficient and preferred method to restore your vehicle back to pre-accident condition. 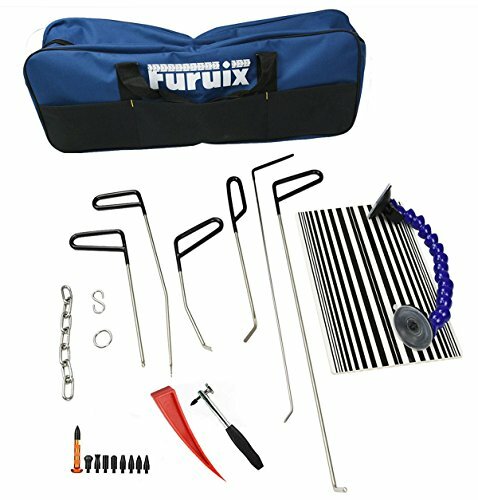 PDR package kit includes:6 PCS PDR Rods with different sizes(c1-c6) ;1PC white-black line board ; 1 PCS S Hook ; 1PC Chain ;1 PCS Siderosphere ;1 repair hammer;1 pcs stainless steel tap down with 9 heads.1 red wedge; 1 pcs bue tool bag. ENVIRONMENT FRIENDLY:Not harm to the original paint.Paintless Dent Removal is the highly specialized method of eliminating dents in cars without having to repaint the surface of the vehicle. This process is non-intrusive, so the labor and materials for a repair project can be minimized, preserving the overall value of the car. HOW TO USE: First use the line board/ PDR reflector board to detect the deformation.This process helps you properly push up the metal. ;then use the metal rods(choose one tip shape that fit most) to move dents outward from the inside or from under the panel. Not every one can do the work well,so we suggest these tools best be used by people with PDR skill experiences. BUY with CONFIDENCE: We are experienced manufacturer with years of PDR tool production experience.All items are under through strict inspected and certified before shipped out.We also accept return if you are not satisfied with your purchase,which seldom happen. If you have any questions about this product by Furuix, contact us by completing and submitting the form below. If you are looking for a specif part number, please include it with your message.